A common misconception about weight loss is “eat less, lose faster”. This belief might lead you to make drastic (and potentially dangerous) changes in your diet…changes that can actually backfire and sabotage your weight loss efforts. To lose weight, you need to use more calories than you consume. This “caloric deficit” can be created either by diet or exercise, or a combination of both. Your body is a smart machine, and senses a large decrease in dietary energy (reduction in calories). A large drop in calorie consumption might work for a few days or even weeks, but eventually your weight loss will slow down and may even stop. Your body doesn’t want to waste away; it needs energy to survive! When your body goes into starvation mode, your metabolism can slow to a crawl – burning calories as slowly as possible to conserve its energy stores. This also can lead to binging, and so begins the vicious weight loss and regain cycle. Muscle maintenance (having a good amount of muscle makes losing fat easier) requires adequate protein in your diet. When you eat too little calories for an extended period of time, your precious muscle is one of the things that your body will start to get rid of! Your body WANTS enough calories for energy, and will break down your muscle tissue and use it for energy if it needs to. Lean muscle burns more calories than body fat and keeps your metabolism fired up. Holding on to as much lean muscle as possible while losing fat will help you reach your goal more quickly and easily. It also will increase your caloric needs when you get to your goal weight – and will allow you to eat more without gaining weight (sounds great, right?). So, how do you ensure that you will keep as much muscle as possible while losing fat and inches and getting to a healthy weight? You eat enough protein, don’t starve yourself, and do strength training exercises. You don’t have to join a gym to preserve or gain muscle – you can do effective workouts at home. 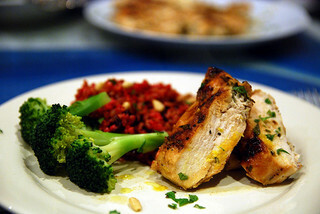 An easy way to make sure you are eating enough is to build your meals around protein foods. Choose your protein source, then fill in your plate with fresh vegetables and other side items. After you calculate how many grams of protein you need each day, divide that number by how many times you will eat every day. For example, if you need 100 grams of protein per day and you want to have a protein-containing meal 3 times a day, you’ll need approximately 33 grams of protein per meal. Choose your protein source first, and add vegetables and other sides to round out your plate. To learn about two ways to make sure you are eating the right amount of food, click here: Calorie Counting or Mindful Eating: Which Works Best?